U.S. designation of Cuba as "State Sponsor of Terrorism"
As we have seen, the fifth and last concert in South Africa by the Minnesota Orchestra was in Johannesburg, which with a population of 4.4 million in a metropolitan area of 8.0 million is the largest city in South Africa and one of the 50 largest urban areas in the world. 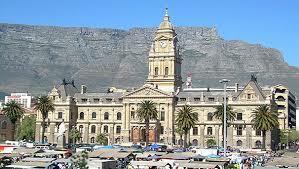 It is the provincial capital and largest city of Gauteng, which is the wealthiest province in South Africa. The city was established in 1886 following the discovery of gold. There are at least three statements by Nelson Mandela which relate to Johannesburg. The first, which will be discussed below, is his statement in his defense against criminal charges in the Rivonia Trial, April 1964. The other two will be covered in subsequent posts: his newspaper article about South Africa’s first decade of democracy, April 2004 and his statement on retirement from public affairs, June 2004. On July 13, 1983, Mandela and nine other anti-apartheid members of the African National Congress (ANC), who were hiding out at a farm near Rivonia, a suburb of Johannesburg, were discovered by the police, arrested and jailed. The trial ended on June 12, 1964, with the court convicting Mandela and seven of the other defendants on all four counts and sentencing them to life imprisonment. Mandela and six others were sent to the prison on Robben Island near Cape Town. The other defendant, who was white (Goldberg), was sent to Pretoria Central Prison, which at the time had the only security wing for white political prisoners in the country. Below is a photograph of Mandela during the trial. After the prosecution had finished its case, on April 20, 1964, the trial turned to the defendants to offer their evidence, and Mandela, an attorney, opened this phase with a three-hour speech from the dock (not the witness stand) that became the emotional center of the trial and thereafter generally was considered one of the great speeches of the 20th century and a key moment in the history of South African democracy. Mandela concluded with these words, “I am prepared to die,” which became the name given to this speech, which is extracted below. “It must not be forgotten . . .that by this time violence had, in fact, become a feature of the South African political scene. There had been violence in 1957 when the women of Zeerust were ordered to carry passes; there was violence in 1958 with the enforcement of Bantu Authorities and cattle culling in Sekhukhuneland; there was violence in 1959 when the people of Cato Manor protested against pass raids; there was violence in 1960 when the Government attempted to impose Bantu Authorities in Pondoland. . . . In 1961 there had been riots in Warmbaths, and all this time . . . the Transkei had been a seething mass of unrest. Each disturbance pointed clearly to the inevitable growth amongst Africans of the belief that violence was the only way out – it showed that a Government which uses force to maintain its rule teaches the oppressed to use force to oppose it. Already small groups had arisen in the urban areas and were spontaneously making plans for violent forms of political struggle. There now arose a danger that these groups would adopt terrorism against Africans, as well as whites, if not properly directed. . . . It was increasingly taking the form, not of struggle against the Government – though this is what prompted it – but of civil strife between pro-government chiefs and those opposed to them conducted in such a way that it could not hope to achieve anything other than a loss of life, and bitterness”. It was a mass political organisation with a political function to fulfil. Its members had joined on the express policy of non-violence. Because of all this, it could not and would not undertake violence. This must be stressed. One cannot turn such a body into the small, closely knit organisation required for sabotage. Nor would this be politically correct, because it would result in members ceasing to carry out this essential activity: political propaganda and organisation. Nor was it permissible to change the whole nature of the organisation. 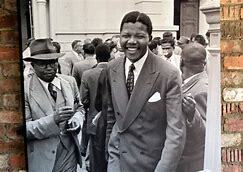 Nelson Mandela Foundation, I am prepared to die (April 20, 1964); Rivonia Trial 1963-1964,, South Africa History Organization; Rivonia Trial, Wikipedia; I Am Prepared to Die, Wikipedia. Before the August 10 concert in Cape Town’s City Hall, the Orchestra’s Music Director Osmo Vänskä and some of the musicians took the 45-minute boat ride from the city across Table Bay to Robben Island to visit the prison where Mandela and other opponents of apartheid had been imprisoned. Their guide, Derrick Basson, 51, who had been a political prisoner there for five years, said that he and every other prisoner were “greeted” upon arrival with these words: “This is no Johannesburg or Pretoria. This is Robben Island. And over here, you’re certainly going to die.” Even the diet was discriminatory. “Bantus” (blacks) got no bread and less fat and sugar than “Coloureds” (mixed-race and Asians). They saw Mandela’s cell, which was barely 6 feet wide. The morning after their concert, a brass quintet from the Orchestra spent some time at the Cape Town Music Institute, a school tucked behind the bleachers of Athlone Stadium in Cape Flats, a low-lying, flat area southeast of the central business district of Cape Town. Trombonist Doug Wright was impressed by the local brass musicians, who really appreciated the visit by the Minnesota players. Later that same morning, the Minnesota brass quintet and others from the Orchestra visited the Eurocon Primary School in Elsie’s River—just outside the city. They were greeted by a rousing song in the courtyard by the school choir. Then inside the Minnesota musicians in small groups with grade-schoolers and their families explained how their instruments worked and played in a string quartet, a woodwind quintet and a brass quintet. The kids rang with laughter when musician Steven Campbell, demonstrating how low his tuba could go, pretended to collapse under the effort. Everyone then returned to the courtyard for dances by local women and performances by local singers, including the 29:11 group, which had performed in Minnesota last month. 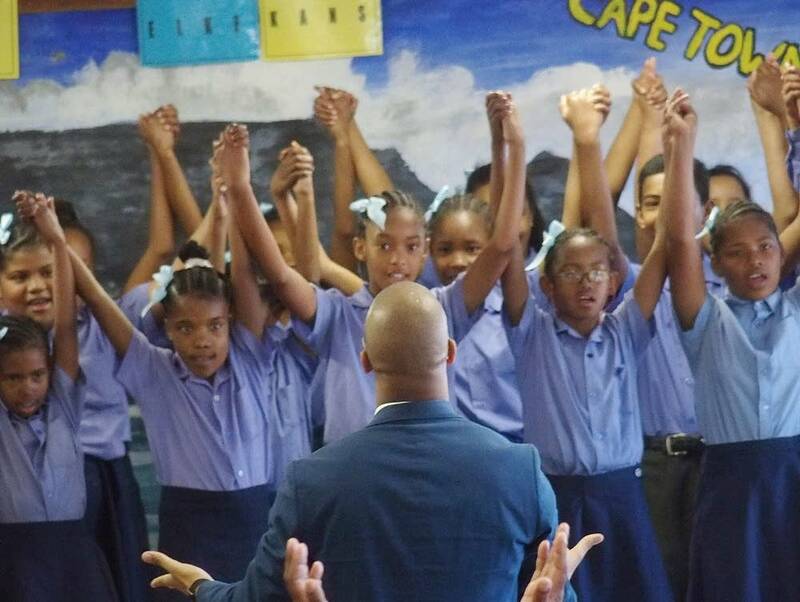 The school choir, led by a 12-year-old soloist sang—in English, Swahili and Afrikaans—“I Am a Small Part of the World.” It brought tears to the eyes of Minnesota cellist Marcia Peck, who said, “I just could see my daughter at Hopkins grammar school singing the same song.” Below is a photograph of the school choir. Others from the Orchestra and Vänskä that day went to the Artscape Theatre Centre in downtown Cape Town to rehearse and coach student members of the Cape Town Youth Orchestra. One of the pieces they played was Sibelius’ Finlandia. This prompted Vänskä to say they needed to know the story of this piece of music and its importance in Finland’s quest for independence from Russia.”When you play, you need to say something,” he said. Cape Town, by the way, is the site of the country’s Legislature and is approximately 31 miles northwest of the Cape of Good Hope at the southern tip of the Cape Peninsula, which is the penultimate southern tip of the African Continent. Ross, In South Africa, Minnesota orchestra makes grim visit to Mandela’s former prison cell, StarTribune (Aug. 13, 2018); Kerr, ‘A very sacred space’: Minn. Orchestra musicians visit Mandela’s Robben Island cell, MPR News (Aug. 9, 2018). Kerr, Music brings together Minnesota Orchestra musicians, South African students, MPRnews (Aug. 11, 2018); Minn. Orchestra, Cape Town/Aug 10-11; Ross, In teaching young South African talents, Minn. Orchestra musicians find their own inspiration, StarTribune (Aug. 15, 2018). These and other articles plus photographs are available online: http://www.startribune.com/follow-minnesota-orchestra-s-first-of-its-kind-tour-to-south-africa/488534621. 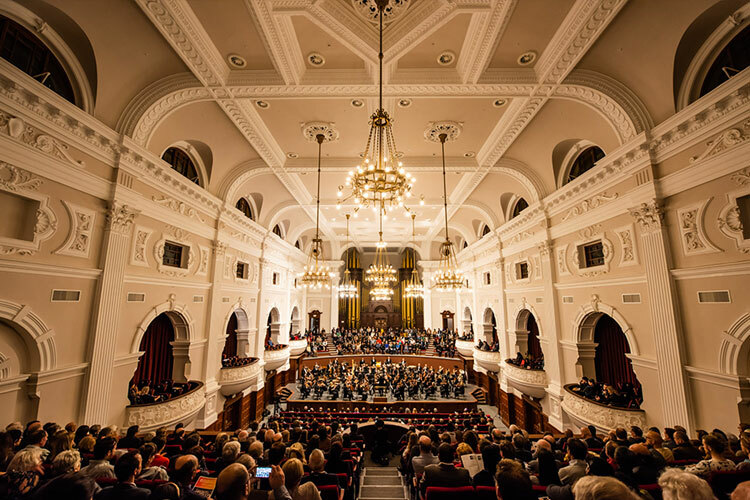 On August 10, the Minnesota Orchestra played the first concert on its South African tour in Cape Town’s City Hall. Below are photographs of the City Hall’s auditorium where the concert was played and of its exterior (with Table Mountain in the background). The concert concluded with Leonard Bernstein’s Overture to Candide, an operetta first performed on Broadway in 1956, and Ludwig van Beethoven’s Symphony No. 5, which had its premiere in Vienna in 1808. After a few standing ovations, Vänskä, for the first encore, turned again to Sibelius. But for the second encore, the director returned to the podium with a surprise. After single drum beats were joined by marimba and horns, the Orchestra musicians started singing “Shosholoza,” a song originally sung (in call and response style) by all-male African workers working in diamond and gold mines and later sung by the prisoners on Robben Island. Mandela described it as “a song that compares the apartheid struggle to the motion of an oncoming train” and went on to explain that “the singing made the work lighter.” Here is one English translation of the lyrics: “Go forward. Go forward, from those mountains, on this train from South Africa. Go forward. Go forward. You are running away. You are running away, from those mountains, on this train from South Africa.” It is so popular in South African culture that it often is referred to as the country’s unofficial national anthem. As soon as the Orchestra started singing this song, the crowd erupted. They laughed, they clapped, they pulled out their cellphones. Then many of them sang along. Before leaving this account of the Cape Town concert, it also should be mentioned that this city played an important part in the life of Nelson Mandela. Roughly 4 miles west of Cape Town across Table Bay lies Robben Island, where Mandela spent the first 18 years of his imprisonment. And on February 11, 1990, after over 26 years of imprisonment, he was released from Victor Verster Prison, roughly 40 miles east of Cape Town and immediately went to the front steps of its City Hall for his first speech as a free man for a crowd of 50,000 people and a worldwide television audience; this speech will be covered in a later post. Minn. Orchestra, Minnesota Orchestra in Cape Town, Blain, Beethoven, with South African flavor, StarTribune (July 23, 2018); Ross, Packing instruments and loads of goodwill, StarTribune (Aug. 5, 2018). Minn. Orchestra, Sommerfest Program;Blain, South African composer celebrates Mandela’s Message, StarTribune (July 20, 2018); Ross, Ode to Minnesota and South African Joy, StarTribune (July 22, 2018); Blain, Beethoven, with South African flavor, StarTribune (July 23, 2018); Ross, Packing instruments and loads of goodwill, StarTribune (Aug. 5, 2018); Ross, In a historic moment for Minnesota Orchestra, music echoes the words of Nelson Mandela, StarTribune (Aug. 10, 2018)(the digital version of this article has beautiful photographs of the concert). Burns, SOUTH AFRICA’s NEW ERA; on Mandela’s Walk, Hope and Violence, N.Y. Times (Feb. 12, 1990).